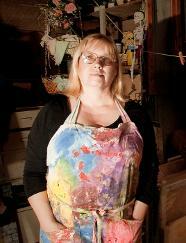 I am an artist living in the beautiful Willamette Valley area of Oregon and I have been painting and drawing since 2005. I graduated from Western Oregon University in June 2013 with two B.A. degrees in Art and Anthropology and have been searching for ways to combine the two subjects in my artwork and lifestyle. With my art, I desire to communicate my ideas, thoughts, and feelings about issues faced by societies and cultures such as spirituality, self-image, fertility, and mortality. To purchase my work visit HERE. © KmBennett Art and/or Kathryn M. Bennett. All images and texts are property of KmBennett Art and/or Kathryn M. Bennett, Artist and are not to be used or reproduced with permission. Images may be shared on social media providing they are accompanied by full credit and link to this website. Please visit and become a fan of my Facebook Art page!